Pomelo is one of four non-hybrid citrus fruits. All other citrus fruits are hybrids derived from one or more of these four. Pomelo is a large fruit about six to ten inches in diameter and weighs anywhere from one to two kilograms. The edible pulp, however, is small relative to the size of the fruit. The bitter rind is thick and inedible. Because of the size of the fruit, some fruit vendors make it convenient for buyers by selling the pomelo in segments. If an entire fruit is too much for you, buying a segment or two might be the smarter way to go. That way, you consume the pomelo before it dries out. To use the pomelo pulp for making this salad, peel off and discard the skin that covers each segment of the fruit. Then use your hands to separate the pulp. 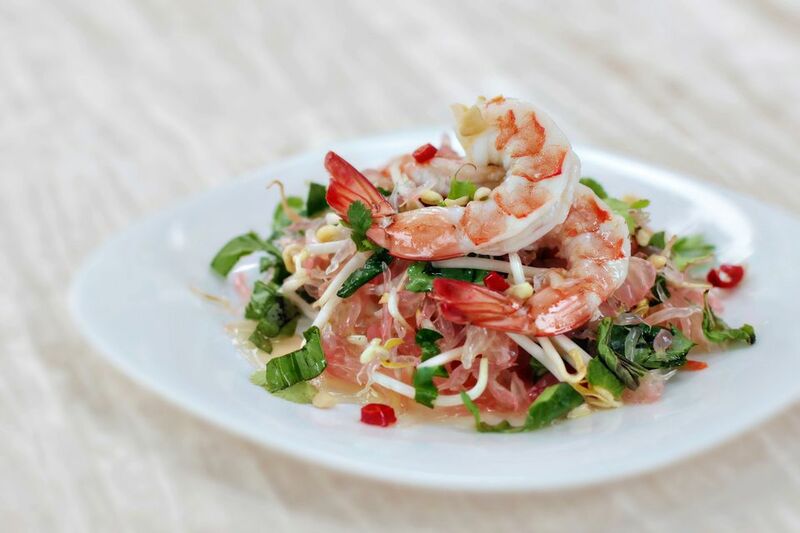 Shrimps go very well with pomelo but you can also use cooked squid or chicken. If using chicken, choose a small fillet (a thigh or half a breast is just the right size) and shred the cooked meat. Make the dressing. In a small jar with a screw-type cap, pour in the fish sauce and lime juice. Add the sliced chili, grated ginger, minced garlic, and sugar. Pour in two tablespoonfuls of water. Screw on the cap and shake until the sugar is dissolved. Set aside to allow the flavors to develop while you prepare the rest of the ingredients for the salad. Cut off the heads of the shrimps. Peel off the shells but leave the tails on. Make a shallow cut along the back of each shrimp and pull off the black thread inside (it's the shrimp's digestive system and you do not want to eat it). Toss the shrimps with a little salt and pepper. Cook by steaming, broiling or grilling. Do not overcook. In a mixing bowl, put the shredded pomelo, mung bean sprouts, basil, mint and cilantro. Toss lightly using your hands. Scoop out the pomelo mixture and arrange on a salad plate. Arrange the shrimps on top. Sprinkle in the nuts. Drizzle the prepared dressing over the salad.